For this Circus Fun cake, I made two, three layered tiered cakes, one 8" round and one 6" round with buttercream. Each was covered in fondant and detailed with fondant stripes, and a yellow icing boarder, representing a circus theme park. A fondant curtain was made with a (gumpaste/fondant) elephant coming out from behind! 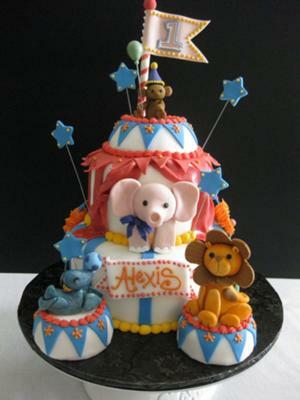 Other circus animals made of the same mixture of fondant and gumpaste joined, with a seal balancing a ball on his nose, a friendly lion and little monkey, seated upon their circus stands (molded, rice crispie treats covered with fondant. Royal icing finishes off the cake with colorful boarders and added detail. This was a fun theme for a first birthday!! how much fondant,and icing supplies did you need to bring this to fruition, first grand childs bday and Im contemplating the project,somewhat expierenced in decorating,not with the fondant though, what would be your thoughts on degree of difficulty, and does an average box cake batter work as well as purhaps from scratch or a pound cake that will be more dense, any info you can send back would be greatly appreciated. The cake is absolutely adorable, especially for a baby's first birthday. The warm and friendly looking animals must appeal so much to a young child, as if they were inviting them to enjoy the most wonderful circus a child could ever want. With ferocious beasts like lions and playful little monkeys, I'm glad you entered your photo here. Keep up the good work and continue to put smiles on your cake eating fans! Join in and write your own page! It's easy to do. How? Simply click here to return to Circus Cake.